Pushed by a line of thick copper wire, the first transcontinental phone call was made in 1915 between New York and San Francisco. Less than one century later, businesses started cutting the cord. Just as consumers leveraged the Internet to switch from landlines to mobile telephones, businesses have shifted from traditional phones to Voice over Internet Protocol, or VoIP. In the simplest terms, VoIP allows you to make phone calls over the Internet. Plain old telephone service (POTS) uses analog signal transmission over copper loops. These landlines have been available since the introduction of the public telephone system, and as you can infer by the name, remain mostly unchanged despite vast technological advances in communications technology. Though POTS is reliable, it was created before the proliferation of cell phones. Compared with VoIP, plain old telephone service is inefficient and inflexible for modern businesses. For example, POTS uses copper wire much like telegraphs did in the 1800s. This means when a phone call takes place, that portion of the line can’t be used for anything else. And aside from voice calls and faxes, POTS can do little else. Today, instead of copper wires, the majority of Internet connections are digital — broadband and fiber optic cable. Digital information is sent over multiple channels, making VoIP cheaper and more versatile than traditional telephones. Contrary to POTS, VoIP doesn’t require dedicated phone lines — just an Internet connection. VoIP service doesn’t require dedicated phone lines; it taps into your existing local area network to provide telephone services. This means VoIP phones can provide sophisticated functionality and scalability to businesses, usually at a reduced cost. Hard phones are physical telephones that look and act like traditional office phones. Basic models have all the features of a normal phone, but high end models may include an LCD screen to make contact management easier. Sometimes called IP phones, hard phones connect to the LAN via ethernet cable. Softphones are not physical devices. These “software phones” are applications that enable VoIP functionality on a computer, tablet, or smartphone. Since these devices are not built for voice calling in an office setting, a headset is often used. Looking for assistance in finding the best VoIP for your company? Answer the questions below to receive recommendations from our partners at Buyerzone. How many locations do you have? How many phones do you need? Vendors may charge per phone, and multiple offices will add complexity to your system, which will be reflected in the price. 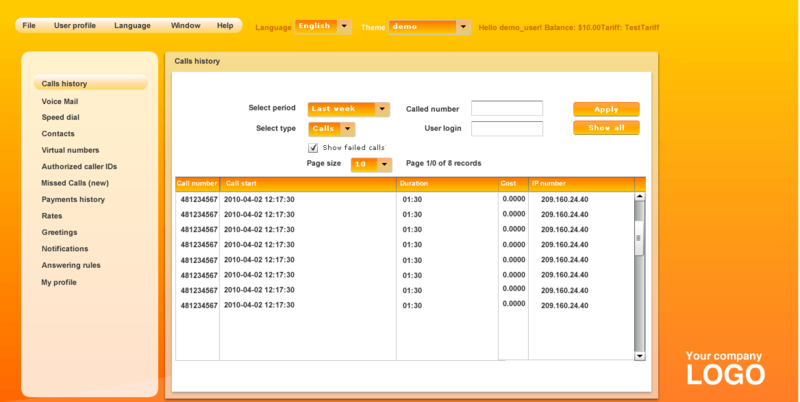 Premium features such as conference calling are often added on top of the monthly fee. Additional usage charges for long distance, call recording, or software for mobile phones may also impact pricing. Industry regulations and legal requirements may affect which vendor you choose and the ultimate cost of a VoIP service. Businesses in the financial sector may require encrypted calling or other security features, while hotels may need to meet safety and privacy standards. Call switching and line management is handled by a device called a Public Branch Exchange (PBX) or Key System Unit (KSU). You can host this on-premise, or avoid the expenses of purchasing, installing, and maintaining the hardware by hosting it in the cloud. VoIP pricing varies among providers, but most VoIP vendors offer cloud, on-premise, and a hybrid approach. You may also require additional services such as SIP trunking, which can be included by the vendor or through a third party integration. Any business that needs to talk to customers or other employees can benefit from a VoIP system. Though enterprises often require more powerful tools than smaller businesses, the use cases across business sizes are essentially the same. Let’s examine some of them more closely. A new business with no existing telephone service can use VoIP services to reduce costs and track expenses. A simple solution that enables phone software to run on employee computers should come with basic features such as voicemail and call routing. If employees use their own phones, look for a vendor that has a native mobile application. This will allow employees to login through the company account, which provides a branded experience for customers and call logs to aid reimbursement of employees. A hosted PBX is a good choice for small or medium sized businesses that have little or no IT resources. If SMBs choose a provider that offers a cloud PBX, then hard phones that connect to the company’s LAN are generally the only hardware necessary. Companies with the resources (or preference) to manage onsite hardware should consider a hybrid solution that allows calls to be directed and managed between multiple phones. Large enterprises need a VoIP system that can manage thousands of employees and remote offices. Companies with a mobile workforce not only needs hard phones on premise, but soft aphones setup on their laptops or cellphones to use while traveling. Enterprises may wish to manage their own PBX hardware in each separate office. Financial executives will want to know the total cost of ownership and the expected return on investment of a new VoIP system. When making the case for modern telephony, be sure to mention the costs associated with your existing system compared to a new one. A modern VoIP system can not only help improve employee efficiency, but save on maintenance, fees, and expansion changes. Be sure to mention that sticking with an outdated system can actually cost more long term. Integrating voice, video, and data on a single network can help maintain employees’ productivity across locations without compromising security or quality of service. The leader of your company is focused on growth, and VoIP allows you to simply add more lines as the team grows. Employees can also conduct business from anywhere, which means work isn’t dependent on where you are, but what you’re able to do. Your IT specialists are committed to providing the technologies your company needs to work effectively and gain a competitive advantage. This means developing a unified communication system that includes office phones, desktop computers, laptops, tablets, and other devices. VoIP platforms can help integrate these internal communications while removing the maintenance and infrastructure burden from IT departments. idX Corporation produces retail fixtures, including custom millwork, display shelving, and wooden display cases for the retail, financial, hospitality and point-of-purchase industries. idX has state of the art manufacturing facilities across North America, as well as locations in Europe and Asia. Their offices were using several different legacy phone systems, which made communications difficult. Costs for toll and conference calls were extremely high, and maintenance was expensive and time-consuming. — Ryan Dibisch, Director of Global Information Systems, idX Corporation. idX chose ShoreTel because they offered the features that idX wanted at a price lower than the vast majority of their competitors. The system design and implementation were simple, and the demonstration showed that the system was easier to manage and use than many comparable solutions. It came down to price and functionality; the system is simple and versatile, yet extremely powerful. The ShoreTel UC solution included ShoreTel Voice Switches, ShoreTel IP Phones, ShoreTel VPN Concentrator, ShoreTel Conference Bridge, and ShoreTel Communicator with Professional Access. ShoreTel is a leading provider of simple phone systems and unified communications solutions that offers both cloud and on-premise deployment options. It was the best VoIP software to meet the needs of idX, but another vendor may be best for your company’s unique requirements. The vendors below are among the leaders in the VoIP industry, and offer a variety of service levels and features to businesses of any size. If you’re curious about any of the web analytics products or features listed in this guide, we’d love to talk to you. Call one of our in-house specialists for a free consultation, or use the Product Selection Tool on our website to get a personalized recommendation.